The performance of the two main parties is clear. They have been neck and neck for some time, with neither as yet able to break clear and establish a sustained lead. But this graph also shows that the respective scores for both the Conservatives and Labour have shifted slightly upwards. Since the middle of March neither party has been below 30%, whereas both dipped into the high 20s earlier in the month. The peaks have started to get a little higher in the past couple of weeks as well. 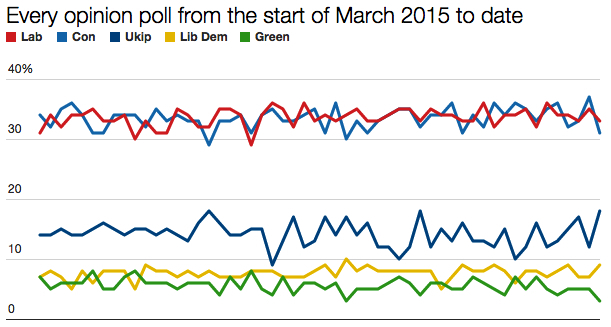 By contrast the Green party’s ratings have slipped, with far more scores of 5% and under since the middle of March. These are only small trends, but they’re ones worth watching as the campaign continues. What is the margin of error? There is a lot of noise in there. Is any shift statistically significant? 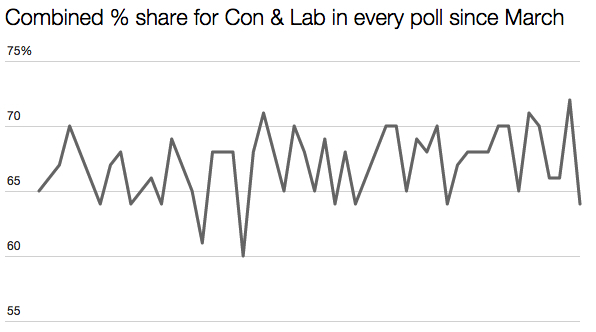 The noise is a lot larger than any real change in the polls. It would be easier to spot trends if the curve were smoothed by adding a “rolling average” graph (ie, each replace each data point with the average of the last, say, ten polls, which has the effect of greatly reducing the random fluctuation between consecutive data points). And something I was planning as a follow-up later this week! I could be wrong but I suspect Green bubble may be about to burst. Greens have a separate party in Scotland and are pro independence and I just wonder if they could possibly deprive SNP of the odd seat of their many potential gains from Lab and from LD? Greens will have no seats in Scotland but I think should hold their only seat south of the border. Unfortunately, for the Greens, Natalie Bennett is a useless leader – the more people see and hear from her, the lower the party’s ratings go. She should take a month off and leave Caroline Lucas to be the public face of their campaign. Really? That would be a PR disaster! A general election campaign is not a good time for political infighting. Lucas could do a bit more to support her party I suppose, as Douglas Carswell has done for UKIP, but the problem is within her own seat she is far more popular than her party and is trying to distance herself from the Green-run Brighton & Hove council. As far as she is concerned, campaigning for the Greens up and down the country would jeopardise her re-election – and getting Lucas back into Parliament is the Green Party’s number-one goal for May 7th. I think the PR disaster boat has already set sail for the Greens. Actually, I was being tongue in cheek about Lucas taking over.